There are several types of residency permits and each has a clearly defined purpose, giving you a specific status during your stay in France. You therefore need to make sure which permit to apply for. Visitor (visiteur): A one-year visa for spouse and minor children of someone who has been working in France for 18 months. A visitor visa is not sufficient to be able work and you must provide your own financial aid for the entirety of your stay. Student (étudiant): Non EU/EEA/Swiss citizens need a student visa to study in France. You can apply for this visa at the French consulate or via Campus France , which is organised by the French government. You need sufficient financial support for the study period (about €815,-/month). While studying, students can work freely without restriction and they may combine work with scholarships or other financial assistance. International students outside of the EU/EEA (and Switzerland) may accept paid employment for up to 60% of the legally defined work year (or 964 hours per year). 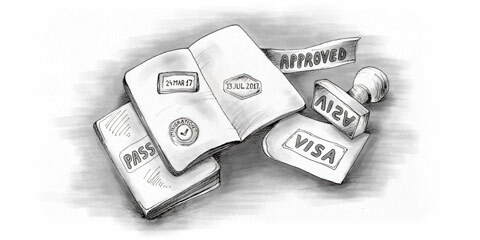 France has recently eased non EU-student restrictions on visa and residence permits. Since 2013, during the first year of your studies you only need to show your (long-stay) visa to prove your residency status. However, you must register with the immigration office within 30 days of arrival. From the beginning of your second year of studying in France, you need to apply for a residence permit. Employee (salarié): To obtain this permit, you need a work permit (see our guide on working permits). Self-employed (travailleur indépendant): Gives the right to exercise a professional activity. To get this permit, you need to be authorised to exercise such an activity in France. As a non-EU/EEA/Swiss citizen, getting a work permit can be difficult. You have to contact the French consulate you depend on and they will provide you with the necessary application form. Furthermore, you have to create a business plan that will be evaluated before any permit is given. Trader (commerçant): Gives right to exercise trade and commercial activity. To get this permit, you need to be authorised to exercise such an activity in France (i.e. have the corresponding and homologated professional qualifications). Scientific (scientifique): Gives right to regular entry and residence in France for scientific research or/and teaching at university level. You need a certificate ( protocole d'accueil) from a research institution or from a university, which states your scientific qualifications and the purpose and duration of your stay. A permanent residence permit (Carte de résident, CR) allows you to live permanently in France. Permits are valid for up to ten years and renewable. Any EU citizen living in France for five years or more, has the right to permanent residence and is not obligated to provide proof of their income or employment. However, you may need to provide proof over the five years to keep your residency valid. You can also obtain a permanent permit under other conditions, i.e. if you are spouse of a French national. The récépissé de demande de carte de séjour authorizes residence in France while an application for an official residence permit is being evaluated. It is valid for three months, renewable, and can allow you to get a temporary work permit. A provisional stay permit (autorisation provisoire de séjour, APS) is for foreigners not legally entitled to remain on French territory (e.g. with an expired visa or permit) who cannot leave for medical, humanitarian or professional reasons. It is valid for at least one month and can allow you to get a temporary work permit.